Every Mercedes Benz Leaving the question: if your Mercedes has a timing chain, when does it need to be replaced? 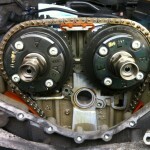 A timing chain is a part of your engine that has direct control of the timing of the upper and lower parts. The belt or chain transfers the rotation of the crankshaft to the camshaft. The camshaft activates the valves, which provides air and fuel to the cylinders. A timing chain is exactly like a timing belt apart from it is made of metal, think of a bicycle chain. These chains can break under extreme conditions but they virtually never snap. The issue with timing chains is that the timing chain tensioners can fail from lack of lubrication, plastic guides or sprockets in the engine can become worn away, causing the chain to “jump” and as such it is helpful to have very clean oil so your timing chain and guides lasts a lifetime.